All-New 30th ANNIVERSARY 3 DISC SET. CONCERT DVD: Never-before-seen 1975 concert from Hammersmith Odeon, London featuring over 2 hours of music. DOCUMENTARY DVD: Definitive story of "Wings For Wheels: The Making of Born to Run" with new interviews & rare archival footage. 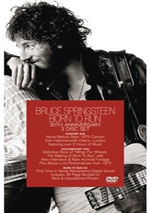 BORN TO RUN CD: First time in newly-remastered digital sound. Includes 48 page booklet of rare and unpublished photos. Although Bruce Springsteen has produced arguably superior albums since 1975, that year’s Born to Run remains his most iconic work. Run broke him as a popular artist and established him with a mass audience. 1984’s Born in the USA sold better, but Run stands as Bruce’s best known and probably most popular record. Notoriously stingy when it comes to releasing nuggets from his archives, Bruce opened up a bit for Run’s 30th anniversary. Fans who want outtakes from the recording sessions will be disappointed by Born to Run: 30th Anniversary Edition, but those who want some video material will get into it. As you’ll note if you look to my grades below, I decided not to give Run a rating for extras. That’s because I couldn’t really decide what would qualify as “bonus” material here. Is the CD the main element and the DVDs supplements? I didn’t agree with that, so I figured it’d be best to consider the whole thing as the main program and not bother with a grade for extras. First things first: the album. As I noted earlier, I don’t consider Born to Run to be Bruce’s strongest release. I’d definitely take 1978’s Darkness on the Edge of Town and 1980’s The River over Run, and on some days, I’d argue that 1982’s Nebraska and 1987’s Tunnel of Love better it as well. That doesn’t mean Run isn’t a terrific album, though. It may not quite deserve its status as Bruce’s ultimate classic, but it certainly works awfully well. Overexposed as they may be, the “hits” of “Born to Run”, “Thunder Road”, and “Jungleland” remain great tunes, and everything else about the album succeeds as well. There’s not a dud to be found on this satisfying record. I owned the first Run CD from the mid-Eighties and it was a disaster. The album’s gone through a couple of remasterings since then, though there’s only so much engineers can do. Like George Harrison’s All Things Must Pass, you have to take Run on its own merits and accept that parts of it will remain a sonic mess. Bruce wanted that dense “wall of sound” pioneered by Phil Spector – who produced Pass, by the way – and this meant that Run came with a lot of murk. The new CD makes things sound about as good as ever, for what that’s worth. The album shows pretty good sonics within the constraints of the source material. I’ll never expect Run to shine, but this CD works well. As for the rest of the package, the big attraction comes from Hammersmith Odeon London 1975. This offers a full length recorded during the tour to support Run. Odeon presents 16 tracks with a running time of two hours, nine minutes and 30 seconds. Off of Bruce’s 1973 debut Greetings from Asbury Park NJ, we get “Lost in the Flood”, “Spirit in the Night”, “For You” and “It’s Hard to Be a Saint in the City”, while 1973’s follow-up The Wild, The Innocent and the E Street Shuffle produces “Kitty’s Back”, “The E Street Shuffle”, “Rosalita (Come Out Tonight)” and “4th of July, Asbury Park (Sandy)”. Run itself gives us the title track, “Thunder Road”, “She’s the One”, “Jungleland”, “Tenth Avenue Freeze-Out” and “Backstreets”. Finally, we get some covers via Bruce’s take on Gary “US” Bonds’ “Quarter to Three” and a mix of hits in the “Detroit Medley”. For some reason, the London 1975 concerts got a bad reputation over the years, though I think a lot of that came from Bruce’s self-assessment. He was under a lot of “new Dylan” pressure at the time and was clearly upset about all the hype that accompanied his first visit to the UK. After this, the general thought was that he and the E Street Band didn’t do their best work at these concerts. Since I don’t have other 1975-era concerts to which I can compare Odeon, I can’t evaluate how it matches up with its tour mates. On its own, at least, Odeon produces a dynamic and satisfying show. The first half of the concert works the best, largely because of the musical choices. A gentle, piano-oriented “Thunder Road” starts things on a fine note, and the full band “Tenth Avenue Freeze Out” immediately brings great punch to the program. Matters continue to progress well from there. “Spirit In the Night” is rollicking, goofy fun in a live show, and the relentless “Lost In the Flood” caps it with a more intense, somber note. “Flood” doesn’t work all that well on the Greetings album, but it’s a killer live, and this incendiary version demonstrates why that is. The rolling Bo Diddley beat of “She’s the One” keeps things cranking, and we get a nice take on “Born to Run” before it became an anthem. It’s interesting to hear the song in this setting, as it was just another new track back then, not Bruce’s most famous and beloved tune. “E Street Shuffle” slows things down a bit; it’s never been a great song, and this show’s version makes it a little too logy for my liking. However, the show soon rebounds, as the one-two punch of “It’s Hard to Be a Saint in the City” – with a terrific guitar duel – and the always impassioned “Backstreets” gives us more fine material. After that, Bruce missteps. “Kitty’s Back” is one of my favorite Bruce tunes, and I was ecstatic when I finally heard it in person during a 2003 Philadelphia concert. Unfortunately, the Odeon version is a dud. Bruce extends “Back” way past its point of expiration, as the track lasts an interminable 16-plus minutes. Actually, it’s not the length that’s the problem so much as the unending jazz noodling that creates the excessive running time. Yeah, “Back” should be a long, exploratory song, but this rendition just is too much and it harms the show’s energy. At least a solid “Jungleland” helps return some fire to the show. Another classic that hadn’t made it to iconic status yet, “Jungleland” sounds very good in this early version. “Rosalita” adds more kick to the show as it tries to reclaim the momentum lost after “Kitty’s Back”, and “Sandy” finishes the main set on a sweet note. The encore proves a little less satisfying for me, mainly because I’m just not a big fan of Bruce’s cover versions. “For You” is a quality original that proves emotional and memorable in its stripped-down incarnation here. (Funny - Greetings never did much for me as a studio album, but its tracks almost always sound great in the live setting.) I’m just not wild that Bruce sandwiched “For You” inside the “Detroit Medley” and “Quarter to Three”. I know lots of Bruce fans love both of those, but whenever I hear them, I can’t help but wish that Bruce was playing an original song instead. They’re acceptably fun and obviously Bruce digs them, but neither does a lot for me. Odeon offers a surprisingly good presentation. I must admit I figured we’d get lots of awkward camerawork and unappealing visuals, but the show instead looked quite professional. This is a well-shot performance that gives us a nice view of the proceedings. The post-production work is solid as well. Editing keeps things moving but never gives into any gimmicks or rapid-cutting techniques. We see a clear take of the action and feel like we’re taking in the show as performed in 1975. A few minor misfires aside, Odeon is a great document from an important stage in Springsteen’s career. 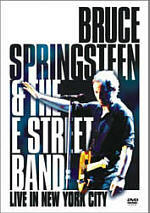 For more information about Born to Run as an album, we turn to this package’s other DVD. Presented anamorphic 1.78:1 with the choice of both PCM stereo and Dolby Digital 5.1 audio, Wings for Wheels: The Making of Born to Run lasts 87 minutes and mixes archival materials with modern interviews. We hear from Springsteen, producer Jon Landau, former manager Mike Appel, engineer Jimmy Iovine, photographer Eric Meola and musicians Roy Bittan, Ernest “Boom” Carter, Clarence Clemons, Danny Federici, Nils Lofgren, David Sancious, Patti Scialfa, Garry Tallent, Steve Van Zandt, and Max Weinberg. “Wheels” looks briefly at Bruce’s first two albums and how they led toward and influenced Run. We get thoughts about the record’s themes, tunes and lyrics, and Bruce gives us breakdowns of some tunes. We also learn about the guitar shown on the cover and see how Bruce composed the album’s tracks on piano. In addition, the show views Landau’s impact on Bruce and his work, aspects of the album’s recording sessions, band changes, mixing and mastering the final product, the cover shoot, and the record’s release. “Wheels” finishes with a look at the album’s reception, the infamous Time and Newsweek covers, and the aftermath. At the outset, “Wheels” starts slowly and can be a little tedious. We hear too much general info and praise for the album without the specifics we desire. However, the program soon improves and becomes quite good. We learn a lot about the various aspects of creating Run, and great deal of terrific archival material appears. We hear elements like an unused intro for “Jungleland” as well as alternate elements abandoned for “Born to Run”. A fair amount of nice analysis appears as well. The show digs into the aspects of writing and recording Run as it plows through that side of Bruce’s career. To my surprise, it deals with the end of Springsteen’s relationship with Appel, though it doesn’t quite convey the rancor that occurred at the time. I can’t call “Wheels” a perfect program, as it doesn’t discuss all of the album’s songs, and it doesn’t give us as much archival material as I’d like. While we find many nice elements, the fan in me really wants more; this hors d’oeuvre frustrates at times. Nonetheless, “Wheels” offers a good general view of Born to Run and entertains as it informs. 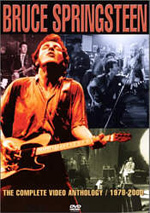 Bruce Springsteen: Born to Run 30th Anniversary Edition appears in an aspect ratio of 1.78:1 on this single-sided, double-layered DVD; the image has been enhanced for 16X9 televisions. For the purposes of this review, I only rated the audio and video quality of the live performance; I didn’t incorporate the documentary into my assessment. As for the Odeon concert, it was a tough picture to rate because of the original elements. At best, it was never going to be very attractive, as the film was shot on 16mm film and done under dark conditions. That said, Odeon was consistently watchable and looked better than I initially expected. Sharpness was erratic. Shots varied from acceptably concise to fairly soft. The best defined images were never particularly tight, but at least the looser bits stayed reasonably distinctive. Definition was mediocre but not a real problem. I noticed no jagged edges or shimmering, and I saw no signs of edge enhancement. Print flaws were pleasantly minor. Grain was the main distraction, but that will never change; it’s inherent in the original film, especially since they shot the flick in such poor lighting conditions. Otherwise, I noticed occasional specks, a few blotches and a couple of small hairs, but these weren’t a distraction. This was a pretty clean presentation, especially considering its age and source. Colored lighting heavily dominated the palette of Odeon. Those tones were passable at best as they shaded everything in the image. The tones could have been brighter and more dynamic, but they stayed acceptable. At least they never became overwhelming or runny. Blacks were quite deep and firm, which came as a nice surprise. Low-light shots tended to be rather opaque, a fact compounded and caused by the filming conditions. A 16mm film made in a small venue with no accommodations for lighting will look dark, and that’s what we got from Odeon. Objectively, this is a problematic image due to the source materials, but I thought it was more than fine given its origins. No such qualifiers and excuses come when I rate the Dolby Digital 5.1 soundtrack of the Odeon DVD. This was a consistently strong auditory presentation. The show offered a nicely open and spacious soundfield. Across the front, instrumentation spread appropriately and distinctly. Elements popped up in the right spots to match the musicians’ stage locations, though things may have been a little too localized at times. It made sense to anchor the left with Danny Federici’s keyboards and to plunk Roy Bittan’s piano in the right, but I didn’t think it made much sense that some other instrumentation also focused strongly on those side speakers. Clarence Clemons’ sax and Steve Van Zandt’s guitar should have popped up between the sides and the center instead of their hard localization in the different speakers. This wasn’t a real distraction, but I’d have liked somewhat more appropriate placement. Bruce’s vocals stayed centered and didn’t bleed to the sides. His guitar came from the left instead of from the center, which would have been more accurate. However, I didn’t mind this, as it made sense to take that liberty to separate Bruce’s playing from Steve’s. The music sounded nicely integrated and airy, as the songs meshed together well and demonstrated a solid stereo image. Surrounds mostly served to reinforce the forward audio. A lot of stereo crowd noise cropped up back there, and the rear speakers provided a sense of concert hall ambience as well. The mix avoided gimmicky material and it stuck with an involving stereo presentation. The DVD presented very good sonics. Bruce’s vocals always came across as natural and accurate. I noticed no edginess or distortion as his singing appeared lively and distinct. Guitars crunched appropriately while drums snapped. Bass response sounded good. Low-end could have been a little deeper, but those elements always remained acceptably tight and lively. Across the board, I heard a lot to like in this fine soundtrack. Although I eschewed a supplements grade for Born to Run, it does include a few components that could be considered as “bonus material”. On the Wings for Wheels DVD we get Live at the Ahmanson Theater, Los Angeles, 1973. A three-song segment, the 21-minute and 56-second piece includes renditions of “Spirit In the Night” “Wild Billy’s Circus Story” and “Thundercrack”. 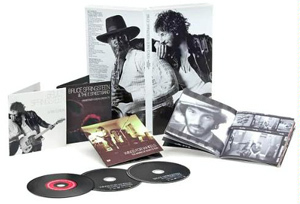 This set is kind of an odd addition to this package since none of the songs maintain any connection to Born to Run. That said, I’m happy to get it. The tracks offer a nice glimpse of Bruce circa 1973 and provide a fine presentation of the songs, although we lose the ending of “Thundercrack”. Audio and picture quality is on a par with the Odeon concert. That was another pleasant surprise, as I feared these numbers would be even rougher in both domains. My only complaint is that we don’t get more material. I’d guess that this is all the footage that survives, but perhaps we’ll see more in the future. Not that there’s much more to get. The Ahmanson show was an odd one. 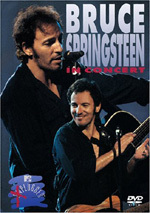 Part of a series of CBS Records “spotlight” concerns, Springsteen actually played as the first of three acts on the bill, and he only did five songs; the DVD omits “Tokyo” and “Twist and Shout”. Note that “Ahmanson” presents a fairly stripped down version of the E Street Band. As in 1975, Garry Tallent, Clarence Clemons and Danny Federici are there, but this edition features Vini “Mad Dog” Lopez on drums; Weinberg was a new addition in 1975. There’s no pianist or second guitarist in this band. David Sancious played with Bruce in 1971/1972 but took a break before he returned about a month and a half after the Ahmanson gig. Roy Bittan took over piano in September 1974, while Steve Van Zandt became the second guitarist in the summer of 1975 for the Born to Run tour. In addition, Run provides a 48-page Booklet. This includes a short essay by Bruce originally composed for the book Songs along with album credits and many photos circa 1975. I’d have liked more text, but this is still a nice little booklet. Never an artist terribly willing to open his vaults for the fans, Born to Run: 30th Anniversary Edition offers a nice move in that direction from Bruce Springsteen. It offers a good-sounding remastering of the original Born to Run album along with a terrific 1975 concert and an informative documentary. The concert doesn’t present great visuals but it looks surprisingly good given that it was shot on 16mm film in less than ideal conditions, and the audio excels. Long-time Bruce fans will clearly adore this excellent package, and it’s a great place for those new to Springsteen to start. I hope this marks the first of many Bruce releases of this sort.